Wherever Raggabund performs they create a great atmosphere. The two pairs of brothers Don Caramelo and Paco Mendoza from Germany as well as the Italo-Swiss De Luca and Mikey Board know how to tear pupils from their seats with reggae, Latin and dancehall music. 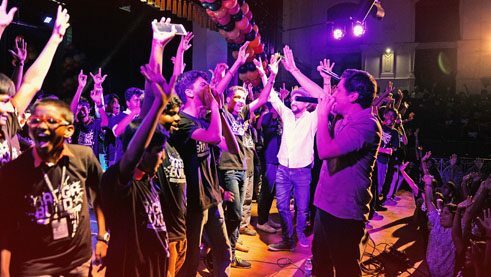 They toured Pakistan, Sri Lanka and India in October and November 2017 at the invitation of the Goethe-Institut for eleven concerts and several workshops. The tour was so successful that they are now back in the region. We interviewed Paco Mendoza shortly before the launch of the new tour. You were recently on a five-week tour of South Asia with the Goethe-Institut. How come you’re back in the region so soon? The 2018 tour is a direct result of our first tour. The Goethe staff witnessed how the much we clicked with the pupils and decided to invite us again. Of course, we really wanted to do it. Asia was incredible for us. We’ve played there a few times and it’s always been great, but holding concerts in schools is something else. A very special kind of energy developed there. It’s terrific to play a concert at 10 o’clock in the morning and the spectators totally go mad. We are especially looking forward to Pakistan. On the first tour we had actually planned two concerts in Pakistan, but unfortunately there were problems with the visas. In the end, we had to cancel the concert in Lahore so we’re making up for that this time. Although we were only in Pakistan for 30 hours, we enjoyed it very much, so we are really looking forward to that gig. What did you experience on your first tour of Pakistan, Sri Lanka and India? 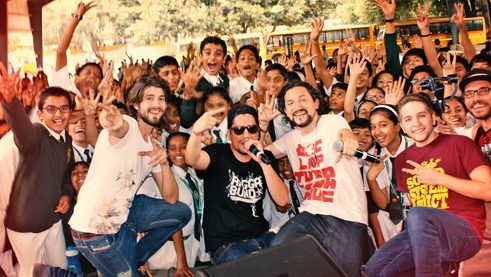 At our first concert in Karachi, we got a good idea of what this tour would offer us, because the pupils just went berserk. At first, they were all sitting on the floor, but by the third or fourth song, they got up and just jumped. That happened during the whole tour: we actually had concerts with seating, but the kids always got up to celebrate with us and sometimes even storm the stage. It’s apparently common in the region when people get really enthusiastic. I think it’s great in Asia, because the kids have few reservations, just like us. After the gigs, we spent ten to twenty minutes just making hundreds of selfies, sometimes with twenty people in them. Concert at Delhi Public School South Bangalore. | Photo: Andreas Leske How would you describe your music? Our music is positive, life affirming, rhythmic and not overly cerebral. Actually, it reflects – sometimes more, sometimes less – the facets of our lives. It’s really important to me that our music is consistently positive. It was great for us that the music was received so well on the whole tour. The pupils mostly knew only a few songs and still sang along to them all. It’s awesome how Caribbean music works worldwide. This music was created from a blend. The interplay of different rhythms and various influences created a kind of world beat that works just about everywhere. You held workshops, too. What were they like? There were two different workshops. My brother, Don Caramelo, taught fundamentals of rhythm in a beatbox workshop and showed the pupils how to create beats with their mouths. That workshop was great for the kids who didn’t speak much German yet. De Luca and I worked on the German language in a second workshop. We love to write lyrics and wrote one song about each city with the kids. Concert at Government Museum Theatre Egmore in Chennai. | Photo: Goethe-Institut What did the pupils learn from you? It would be nice if they took something with them. But even if they only had fun for an hour, we’re happy. Of course, we have a message in our songs, but we sing very fast and also in different languages. But I hope that they felt the positive energy that we feel on stage and that we like to carry on. Are German lyrics good for learning German? Lyrics are a great way to learn languages. Many fans have told me that they’ve learned Spanish with my Spanish songs because they started translating them and looking at the sentence structure. And that it was a good exercise – extra-curricular, of course. You’ll never learn another language just because of lyrics. But it’s great when music awakens interest in a language.